It is New Year soon. Where do you spend year’s end and new year? 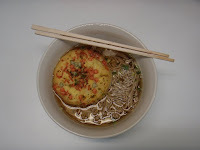 There is a custom of eating soba-noodles on the night of the New Year’s Eve in Japan. This soba-noodles are called “toshikoshi-soba”. Toshikoshi means “year-crossing” and the long noodles symbolize long life. It is said that you must finish eating this soba-noodles before the new year starts. If you leave some soba-noodles, your luck with money in the next year will be bad. Please try to eat soba-noodles on the New Year’s Eve. Please have a good New Year holiday!! ‹ Japanese Language School Asahi Nihongo on TV again.